Welcome to issue 5 of liveartwork DVD, a unique publication showcasing contemporary live art. Somewhat by chance Issue 5 has ended up consisting of a selection of more 'mature' performance artists, all with uniquely different approaches to performance art. Working with text, video, solo and group performance, for over 20 years, Gary Stevens has been one of the UK's most interesting performance artists. 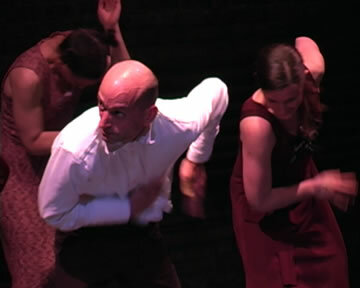 Also with over 20 years experince are the Chicago based performance theatre group Goat Island, presenting here a video of their most recent work. Esther Ferre and Stuart Brisley are both recognised as founders of performance practice in their home countries (Spain and England respectively). Both performances were filmed at the Bone Festival in Bern, Switzerland, which this year had the theme of "The Long Breath - Performers over 60". Marilyn Arsem is a solo performer and teacher of performance based in Boston, USA who has presented her durational work at diverse international festivals. Lastly there is the late American artist Stuart Sherman, an artist who I personally greatly admired and I am please to be able to present this rare video documentation of one of his unique solo performances. The DVD has a total running time of about 100 minutes. Click on the names or scroll down the page to read more. To get a copy of liveartwork DVD issue 5 click on the 'order' link above. Gary Stevens has worked with live performance since 1983. Performances with groups for the stage include: Invisible Work, If the Cap Fits, Different Ghosts, Animal, Name and Sampler. He has also produced large scale ensemble pieces such as: And, Here and There, Pieces of People, Possum and Flock. Solo work: Thread and Not Tony. He has had two shows at Matt's Gallery in London, both video installations, Slow Life and Wake Up and Hide. He lives in London, where he currently teaches Fine Art at Byam Shaw and Wimbledon Schools of Art. He also runs a performance lab at Artsadmin initiated in 1999. Ordinary, everyday actions with speech are constructed and broken down into discrete parts and played by the group of 10 performers, drawn from diverse backgrounds in visual arts, dance and theatre. The performers then promise and frustrate narrative development through repetition, which perpetuates an otherwise brief encounter. The spectators walk through and around the same space. It is playful, simple and unadorned. It is seemingly casual but precise. And was first performed in May & July 1997 at the South London Gallery. The performance consisted of a 35 - 40 minutes loop of different phases of live action that ran, with some short breaks, from 10am to 6pm (the opening times of the gallery). The video is an extract from a rehearsal prior to opening to the public. Initially commissioned by South London Gallery with support from an Artsadmin bursary, subsequently developed with funding from the Arts Council of England. Based in Chicago, the Goat Island performance group began in 1987. They have created eight performances and have toured nationally and internationally. Their most recent work When will the September roses bloom? Last night was only a comedy was selected for the 37th Annual Venice Biennale International Theatre Festival. Goat Island is currently developing its last performance work together which will be completed and toured in the beginning of October 2007. Goat Island began creating their eighth performance work with the question: how do you repair? Drawing on diverse sources for dance/movement sequences, theatrical scenes, and spoken texts the company begun mining The Wind (a silent film from 1928), the history of the teaching of the alphabet in America, the time/space patterns of the Fibonacci sequence spiral, the poetry of Paul Celan, the philosophy of Simone Weil and household repair manuals and diagrams. The piece questions our place in a damaged world and our aptitude for repairing it. The performance is designed to take place over two nights with the knowledge that an audience member might only see one performance so each night offers a complete experience in itself. Approximately 15% of each night's performance will constitute material unique to that night, and while the other performance material will be repeated, much of that will be in a different sequence each night. This dynamic structure reflects the performance's themes of repair/reversibility and intentionally produces shifts in audience perception and interpretation. When Will the September Roses Bloom? Last Night Was a Comedy was co - commissioned by Performing Arts Chicago (USA), Arnolfini (UK), Dance 4 (UK), New Moves International (UK), Kampnagel (Germany), and the College of the Arts and Wexner Center for the Arts at the Ohio State University (USA). Goat Island's work is partially supported by a CityArts Program 1 grant from the City of Chicago Department of Cultural Affairs, the Illinois Art Council, a State Agency, and the Richard Driehaus Foundation. Goat Island (2007) Core: Karen Christopher, Matthew Goulish, Lin Hixson (Director), Mark Jeffery, Bryan Saner & Litó Walkey. Born in San Sebastián, Spain in 1937 Esther Ferrer is best known for her performances, which have been her principal form of artistic expression since 1965, both as a soloist and as a member of the group ZAJ. Her work has always been oriented towards ephemeral artistic action rather than to permanent artistic production. She created, in collaboration with the painter José Antonio Sistiaga, the first "Workshop for Free Expression," in the 60s, an activity that was to inspire other similar groups in Spain. Since the 70s she has also been active in the plastic arts, working with reworked photographs, installations, canvases and constructions based on the prime number series. Her work is a very particular kind of minimalism, which she sometimes terms "rigorous absurdity". Esther Ferrer has performed throughout Europe (Ex-Yugoslavia, Poland, Germany, Italy, France, Switzerland, Belgium, Hungry, Holland, Denmark, Norway, Slovakia, Bulgaria, Czech Republic, Spain etc.) as well as in Cuba, the United States, Mexico, Japan, Thailand and Korea. Performance continues to be her principal activity although she has created many shows in museums such as Foundation Miro (Barcelona - Spain), Centro de Arte Reina Sofía (Madrid - Spain), Koldo Mitxelena Kulturonea (San Sebastián - Spain), Centro Andaluz de Arte Contemporáneo (Sevilla - Spain), Museo de Neufchatel (Neufchatel Switzerland) as well as in the J. and J. Donguy Gallery, Satellite Gallery Lilian Vinci Gallery (Paris - France) and Trayecto Gallery (Vitoria - Spain). 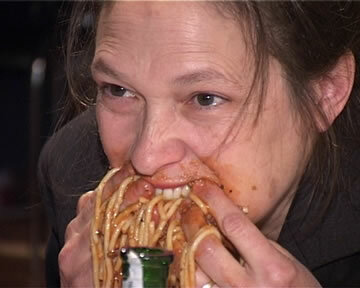 In 1999 she was one of the two artist representing Spain in the Venice Biennale. Las Cosas was performed at the 9th Bone Performance Art Festival. This year, under the title of 'The Long Breath' the programme featured international performance artists of 60 years old and over. About Las Cosas, Ferrer explains, "I don't know exactly when I did this for the first time, because first I write the idea, organize the performance, write a score, and then, one day, I decide to do it. Normally the duration is about half an hour but that is aleatory, because it can change every time I do it. I never explain my performances, I prefer that others understand it by themselves. Their interpretation is as good as mine." . Born in 1933, Stuart Brisley is widely regarded as the godfather of British performance art. Obtaining notoriety during the 1960s and 1970s, his work dealt with challenging the human body in a physical, psychological and emotional manner, and often used faeces as the subject or a material in the construction of his work. He has been a prolific writer, painter, performer, educator and contributor to the British arts scene and has recently helped form the UK Museum of Ordure. Two Last Breaths approaches the dilemma of the end of life, using the age old means of humour/horror. It is a response to the title of "The Long Breath" of the event at the Maschinenhaus in Essen where the work was first performed. The title of the 2006 Bone Festival was also "The Long Breath - performers over 60". Marilyn Arsem has been creating live events since 1975, ranging from solo performances to large-scale site works. She has presented work throughout Europe, Asia, North and South America. In her recent performances, Arsem has focused on creating site-specific works that respond to the history or politics of the country, engaging with the immediate landscape and materiality of the location. Arsem is the founder of Mobius, Inc., a Boston-based interdisciplinary collaborative of artists. She is a full-time faculty member at the School of the Museum of Fine Arts, Boston, where she heads the Performance Area and is a Graduate Advisor. American Foreign Policy II - A meal with a Polish friend. A demonstration of America's treatment of other countries. As I travel, I am acutely aware of the international image of the US, and its imperialism. I have no choice but to own it, even though I don't agree with it. The site of the festival, a former restaurant, suggested the activity. My kind, willing friend, Polish artist Przemyslaw Kwiek, did not know what to expect when I asked him to join me for a meal. Undertow - Valparaiso, Chile: the smell of the sea in the air; bundles of dried seaweed for sale in the market; a small room in a waterfront warehouse, with a ditch running through it. Filing the room with fresh seaweed, I slowly rolled through it for over three hours until my body was completely encased in it and only my feet could be seen, dangling in the water. Filmed and edited by Richard Piegza. 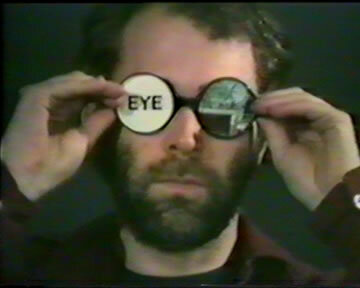 Based in New York for most of his artistic career, Stuart Sherman's worked encompassed theatre, performance art, film, video, text and collage. In whatever format, his work was characterised by a deadpan, conceptual sense of humour and wit which was underscored by rigorous complexity and genuine experimentation. In the late 60's Sherman performed in New York's independent theatre community, working with, amongst others, Stephen Brecht and Richard Foreman. It was Foreman in particular who inspired Sherman to begin his own explorations with performance. Initially he made small performances in private, developing a complex language of objects and actions. He retained this intimate, almost shy approach to performance as he developed his series of 'Spectacles' - usually consisting of a sequence of individual actions carried out using small, innocuous objects involved in complex and often incomprehensible interactions on the top of a small, portable table. In addition to the solo performances, in the 80's Sherman made several 'theatrical' works, sometimes using groups of performers, inspired by classic theatre pieces including Hamlet, Oedipus Rex, and Faust. 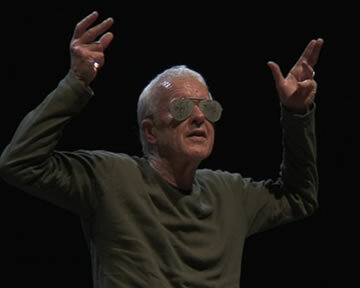 Although performance was a central part of Sherman's practice, arguably he was more recognized for his work with film and video and examples of his work are available from Electronic Arts Intermix (www.eai.org). Sadly Stuart died in 2001 at the age of 55 and it appears that the only remaining documentation of his performance work are second or third generation VHS tapes in the personal archives of his friends. Therefore I have to state that the videos included here are not of the best technical quality and are copies I have made from material lent by a friend. I do not have explicit permission to publish this material but I feel it is important to make at least part of Stuart's work accessible. Unfortunately, I also do not know who filmed the documentation and cannot give them their due credit, however I would be very interested in hearing from camera person if they come across this DVD.